Sakshi Shrivastava is a digital media marketing executive and a writer. She is one of the founding members of Fuzia (www.fuzia.com). She is an English Literature graduate who has always been passionate about women empowerment. Sakshi has also worked with Muskaan, an NGO for underprivileged children, dedicated to their education and upliftment and Ektara Collective, a film production collective which works with and casts amateur actors from different financial backgrounds. Through her academic years, she worked with several other organizations and developed an understanding of what actually brings about a change in people’s lives. Her journey with Fuzia began out of sheer passion and a desire to do understand the lives of women from myriads of backgrounds. 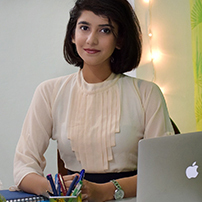 She began her work as a writer for Fuzia and now looks after its digital marketing to help Fuzia reach a wider audience, writing and editing powerful content to educate people on critical issues and working on partnerships with organizations with similar missions. She works on building a name for Fuzia so that it reaches all those who need a platform for sharing their thoughts. In future, she wishes to learn and educate herself more on the real issues facing feminism, help Fuzia reach individuals from all over the globe while tackling the grass-root issues that hinder women’s growth. She is the youngest member of the core team and she is set to make a change, no matter how long it takes.